. Rooms and apartments are available from 2 pm on arrival day. Please vacate rooms and apartments by 10 am on departure day. 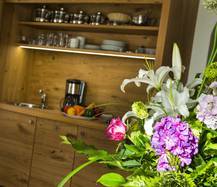 All rooms are for 2 persons - apartment "Ortler" for 4 persons. A surcharge of EUR 10 applies for each additional person. Breakfast is available on request (EUR 15 per person) For stays of 1 to 6 bed nights we charge EUR 35 for the end-of-stay cleaning. For stays of 1 to 3 bed nights we charge EUR 100 - apartment "Ortler" EUR 160. For longer stays the cleaning is free of charge. In the apartment could not stay, life, sleep or eat more persons, how it does confirm in the booking. If there is the wish to have guests, it must be allowed from the hirer.